Big things come in small packages, and Fluval’s new Evo 5 aquarium is certainly looking to prove that point. Coming in at a whopping 5 gallons, this new Evo aquarium is actually an all-in-one unit, meaning that the lights and filtration and built right into the setup. This peninsula shaped nano has a rear chamber dedicated solely to filtration, which consists of three stages and is powered by an adjustable speed circulation pump. 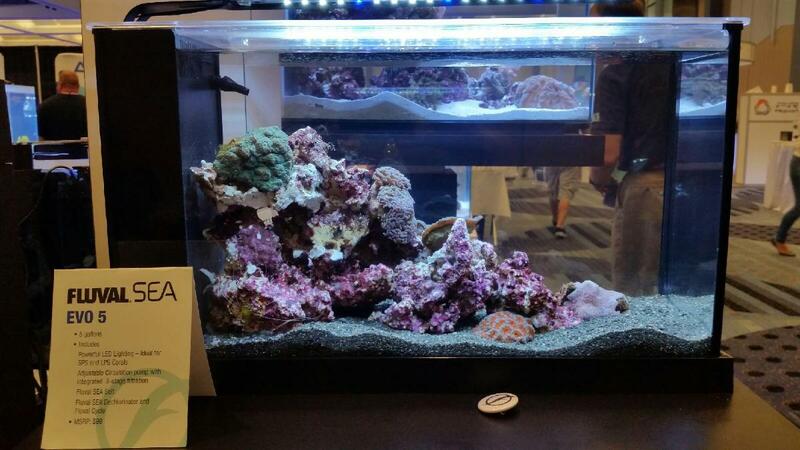 The Evo 5 comes with its own LED light fixture, which mounts directly to the back of the tank. The tank is topped with a euro-brace or sorts, but think of it more as a lid with a hole cut out to let the most about of light in. The tank will come packaged with all of the above plus a bag of Fluval SEA Salt, Fluval SEA Dechlorinator, and Fluval Cycle. The retail price is set at approximately $100, which is quite the value considering all of the stuff that comes with it..
Isn’t this a Spec V?? i picked up a fluval EVO 5 last night, and my purchase did not include salt, dechlor, cycle. i referenced your article, and after my LFS-dude and I searched the actual package and printing/contents/info, we concluded there IS NO mention of included items. Perhaps the author should update their article.